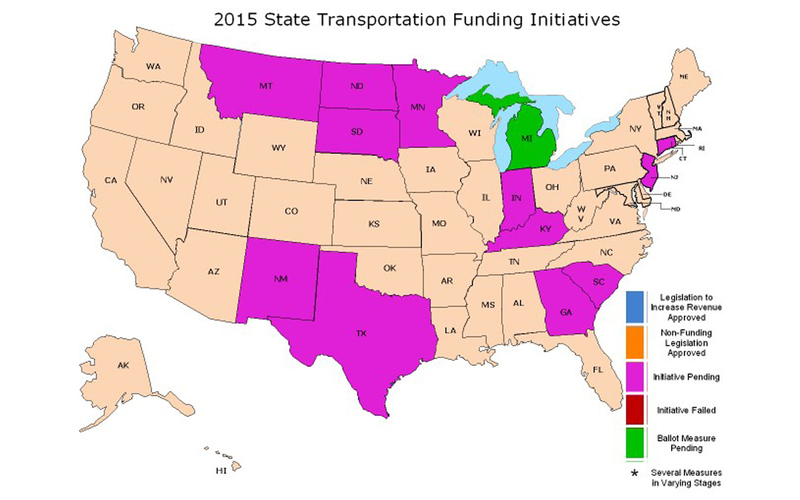 The Transportation Investment Advocacy Center’s first 2015 report on state transportation legislation is now available. Thirteen states are currently considering transportation funding legislation, with more expected as the year progresses. In January, several states began introducing new bills for the 2015 legislative session. South Dakota Senate Bill 1 was introduced Jan. 5 to raise the state’s motor fuel tax and increase vehicle license and registration fees in order to generate funds for transportation construction and maintenance. The Minnesota legislature proposed 11 transportation funding measures. A Georgia lawmaker introduced a bill to increase the state’s gas tax and decrease the state’s income tax to offset the tax increase. Several proposals to increase the state gas tax were introduced in South Carolina. Two bills proposed in Kentucky would establish a floor on the state’s variable rate gas tax. Two bills to provide road funding for oil-producing regions were introduced in North Dakota. Massachusetts Governor Charlie Baker (R) released $100 million in local road funding, completing the total Chapter 90 funds promised in 2014 House Bill 4046. The Connecticut Bond Commission approved a $5.75 million bond for new rail station construction and maintenance on two existing stations.